I must confess: choosing just 3 books to include in this post was not an easy task. I have a whole book cabinet stuffed with nutrition books and most of them are on feeding kids. But, there are a few that I recommend to parents more often. But I know you are busy. I have stacks of unfinished books by my bedside table so I know how it feels when you only go through a couple of pages before falling asleep. Every night. So I decided to create a quick synopsis of each book so you know exactly which one is the best match for you and how you can get all the information you need, fast. I believe it is an absolute must for each parent who is looking to raise a kid with a healthy relationship with food and understand more about feeding babies and toddlers in general. Ellyn Satter is a registered dietitian, social worker, and feeding expert who created the concept of the Division of Responsibility. But reading this book is not easy. First, you may be pushed to reconsider your own relationship with food and become a better parent overall. Things have never been the same for me after I first read Child of Mine and I definitely went through some pretty intense growing pains as a parent back then. Next, Satter puts the emotional dynamic between the child and the parent in the cornerstone of the meals, and this may make you reconsider how you talk, behave and think about food and feeding your child. Satter will also make you walk your baby and toddler’s shoes, on every page. But the unbeaten benefit will be a clear insight into your baby and toddler’s behavior around food and eating and what exactly you need to do to support them in their learning. 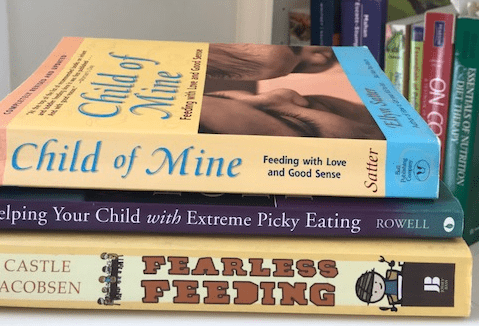 Warning: it may take you not one, but two or more reads and everyday practice to master the responsive feeding approach Satter promotes and let go of mealtime pressure. In our Facebook group I run with Adina Pearson, many parents have read the book but they still have questions and concerns, every day. But once you got it under your belt, nothing will make you turn back, I promise. The clarity and confidence at mealtimes and seeing everyone happily sitting down to eat a meal are priceless. Just got a baby and want to start with the right strategy, whether breast or formula feeding. It is a book you will be referring to again and again as your child grows. Aimed at parents of children 6 months to 18 years, it is based on recent research and is clearly organized so you can quickly find what you need. Both authors are registered dietitians I have been following for quite some time – Jill Castle and Maryann Jacobsen. 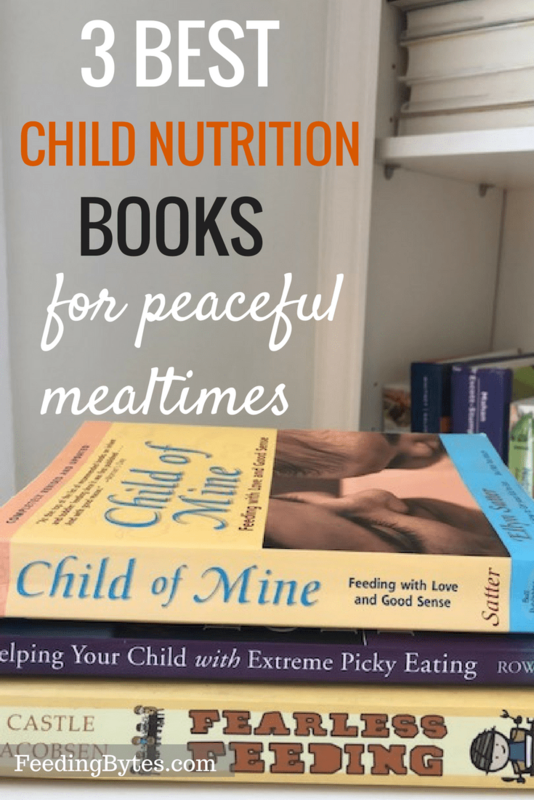 They have collected a plethora of information on feeding kids on their websites so the book is a like an updated and condensed version of everything they have been writing about for years. Jill’s website. Maryann’s website. My favorite thing about Fearless Feeding is the ease of use and plenty of clever age-specific charts, including meal plans, important nutrients for each age and even summary of kids cognitive development, so you can adapt your nutrition talk to your child’s age, without overwhelming or triggering food issues. If you have two or more kids, you can easily jump from one chapter to another and get all the information you need for a particular age, including typical behaviors around food, potential concerns to look out for, like the picky toddler stretch or body image issues in teens, a snapshot of important nutrients and even recipes to include in your family meals. Who like case studies and real-life examples: Jill and Maryann made sure to include lots of stories from their professional experience. Have kids of different ages and need access to age-specific advice. Fearless Feeding covers most of the stages and specific areas of childhood nutrition like starting solids, picky eating, navigating school meals, sports nutrition, and body image issues in teens. I could not wait for this book to come out a few years ago and it proved to be an amazing resource for many parents of extreme picky eaters I am working with. It is written by a medical doctor, Katja Rowell and a Speech Language Pathologist, Jenny McGlothlin, both brilliant child feeding experts. We now know that some kids need more support when it comes to feeding. Those who have underlying issues interfering with eating, like oral motor delays, sensory needs, food allergies or anxiety, have more trouble enjoying meals and expanding variety. This book gives hope and clear guidance to parents who have to take into account their child’s unique challenges. What I love about Helping Your Child with Extreme Picky Eating is that, despite the focus on specific physiological and emotional issues some kids experience, it also teaches parents how to feed their kids in a pressure-free way and build a positive relationship around food. So yes, you will have to start with de-stressing mealtimes and managing mealtime anxiety, both for you and your child. You will also learn how to space meals and snacks, organize family meals and incorporate safe foods. Next, the authors will help you understand what may be going on under the surface of your child’s puzzling eating behavior and the specific steps you can take to help him at home. In case your little one is a candidate for a feeding therapy, you will find out how to choose one that is developmentally appropriate for your child and will support YOU and your child the best. And, most importantly, how to identify and avoid therapy approaches that may make things worse, not better. Need a step-by-step guide to support their child with underlying challenges like special sensory needs, oral motor delays, anxiety and food aversions. Have not seen positive results from a feeding therapy and are looking for a more responsive, child-centered approach. Are looking for strategies and exercises to use at home for kids with oral motor or sensory challenges. Have you read any of these books? What are other child nutrition books you like? Thank you Natalia! I also really like ‘Child of Mine’ and I’m looking forward to reading the other two. Another of my favorites (although for older kids) is ‘Fueling Young Athletes’ by Heather Mangieri. Great information for all those kids playing sports. Oh, that’s a good one to check out, thank you! I have one by Jill Castle, it is also very good. I need to write another roundup, there are so many kids nutrition books I love. I love both of Katja’s books and all of her work! It was so hard to pick just 3. I ofter recommend Love me, Feed me to foster parents but it is a great read for everyone, of course. Thank you so much for bringing it up. I got so excited about this article because it has to things I love, all these three nutrition books!! !﻿ Actually, I am looking forward such a post. Thank you so much for these awesome recommendations! I love this!! The perfect list for parents!!! Thank you so much! I have many-many-many more books, as you can imagine, it was a tough decision to stick to just 3 :). Kids nutrition is an important topic. It’s a good message for parents. I think it’s helpful for new parents cause their ideas about children are very low.It’s very useful blog.Thanks for your advice. Thank you. I agree, it’ such as important topic and I am happy that there are reliable and well-researched resources I can share with parents. I am also doing my best to keep this blog up to date with all the current research and recommendations and I very much appreciate your support.